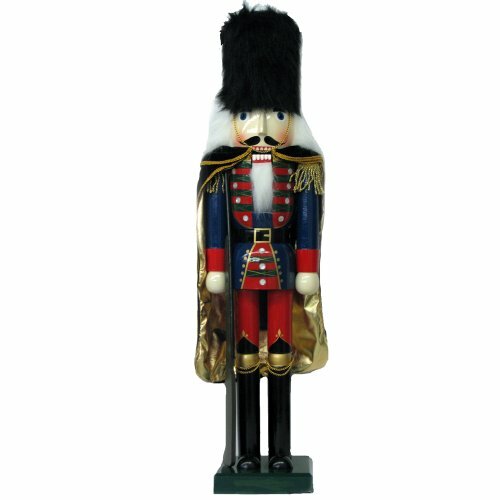 This Kurt Adler 36-Inch Wooden Nutcracker Soldier is a beautiful, classic way to add to your holiday décor or nutcracker collection. The soldier is wearing a blue jacket adorned with gold detailing at the shoulders and red and green detailing at the front, a tall black hat with a gold chin strap, red pants, tall black boots and a regal light purple cape. Manufacturer: Kurt S. Adler Inc. Publisher: Kurt S. Adler Inc. Studio: Kurt S. Adler Inc.
Alexander Taron Importer 32-333 This Ulbricht/Seiffener Santa Nutcracker Is Holding a Christmas Tree an d a Sack Of Presents an d Is in Natural Wood Finish.